A Cardboard Problem: Is it March yet? The northeast had an unseasonably warm today. I spent the day working, but it was in Wildwood, N.J. When I could stand on the beach with a short-sleeved shirt on in December, it really only makes me think of one thing. Sadly, it’s not Global Warming. That was the second thought. The first was Spring Training. I like football. As a New York Giants fan, it didn’t get much better than last year. This year is shaping up to be a great one as well. I love the sport. I would even call it a passion. It’s the reason my life has ended up the way it is. Baseball, in a sense, has directed my life. So, usually the first thing I think about is Spring Training when the weather starts getting warmer. Although, it shouldn’t be warm yet. It’s still 2008 and fans in the area are basking in the glow of the Phillies World Championship. It makes me eager for the season and the New York Yankees to get on the field. My ideal World Series would be the Yankees and Phillies, simply because I’m greedy and would be able to go to all the games for free. So, here’s to the warm weather and the countdown to Spring Training. 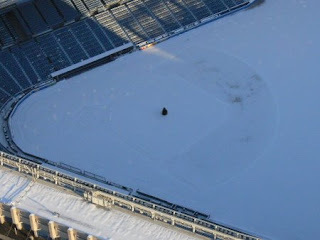 By the way, the dot on the mound is a Christmas tree. It's field at Yankee Stadium. When I lived in the Philadelphia area I judged the seasons by baseball. The first day of spring was the first day of Spring Training. The first day of summer was the first day of baseball season. The first day of fall was the first day of the playoffs. The first day of winter was the first day I had to scrape ice off my windshield. I hated winter. I live in Houston Texas now and the seasons are completely adrift from the calendar. I still count the seasons the same but it's never winter here.